And so this premier event moved into the new century. Tradition continued with all the favourite rides filling the Forest Ground. There are always new rides making their debut, and in 2000 these included local showman James Mellors' Big Ben drop tower, and northern showman Billy Crow's City Hopper jumping frog. On a misty early Sunday morning, the grand cavalcade of transport can be seen arriving for the pull-on. This is followed by the major attractions in full swing. 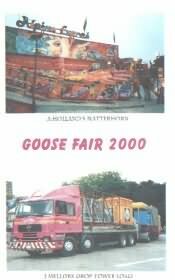 So sit back and relax in the comfort of your home and enjoy the unique atmosphere created by the famous Goose Fair. The DVD features a hi-fi stereo soundtrack with no commentary.